This week has been a busy one (as always) but enjoyable. 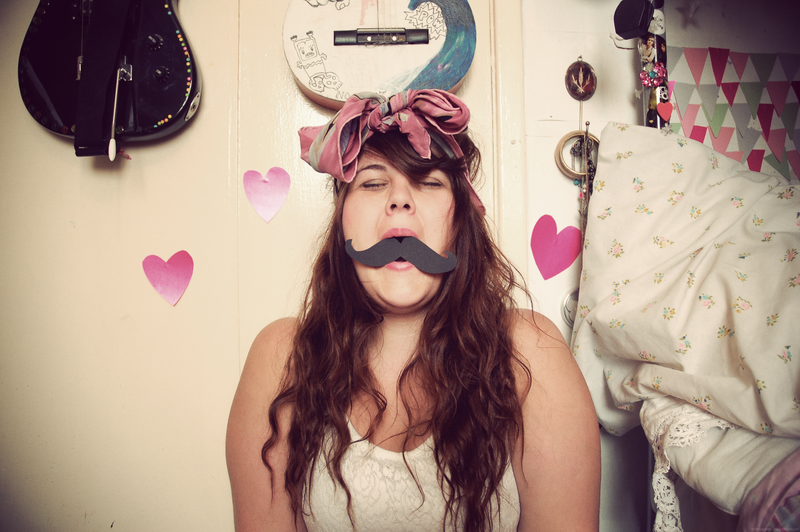 Forgive the silly third photo, to much time alone in my studio does funny things to me. But I enjoy being silly. I am currently working on re-branding RubyRaeLove which is something that I am really enjoying, expanding into fashion is something i have always always wanted to do, so fingers crossed I can make the dresses as beautiful as my vision. I think I will have a limited amount of about 6 of one design and 3 of the tattoo design. Alot of you have asked me where i got my fabric printed I got mine printed over at spoonflower in america, the quality is pretty awesome as you can see from the pictures, I am excited to get stitching! This week I have been rather obsessed with my new (vintage) scarfs which I am using to jazz up my hair; a head scarf is the perfect way to introduce colour into any outfit and the perfect way to tame my mane! 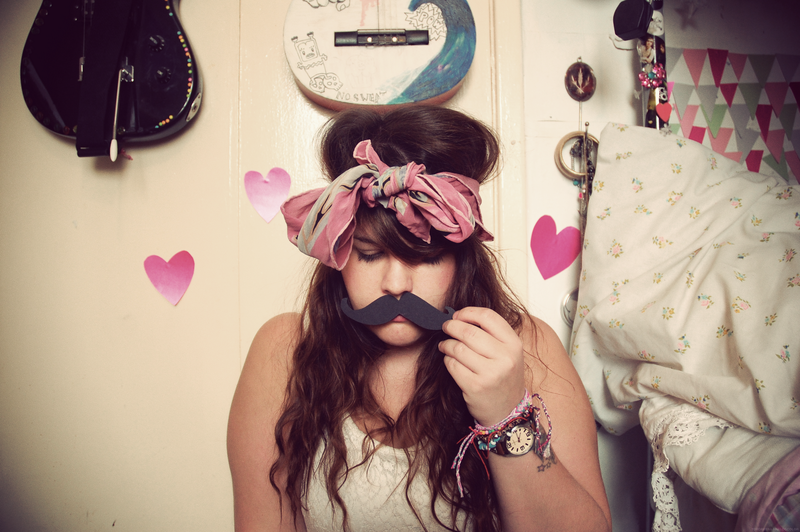 So this is what I am currently wearing the card moustache is totally optional! At the moment to cheer myself up I have decided to fill my room with colour and including what I am wearing, there have been some amazing blogs out there at the moment that have really inspired me to take the plunge with colour. I decide to mix the bright pinks with my favourite white lace monki dress, how do you introduce colour into your outfit? you always look like your having an grate time. The silly pictures are always needed! 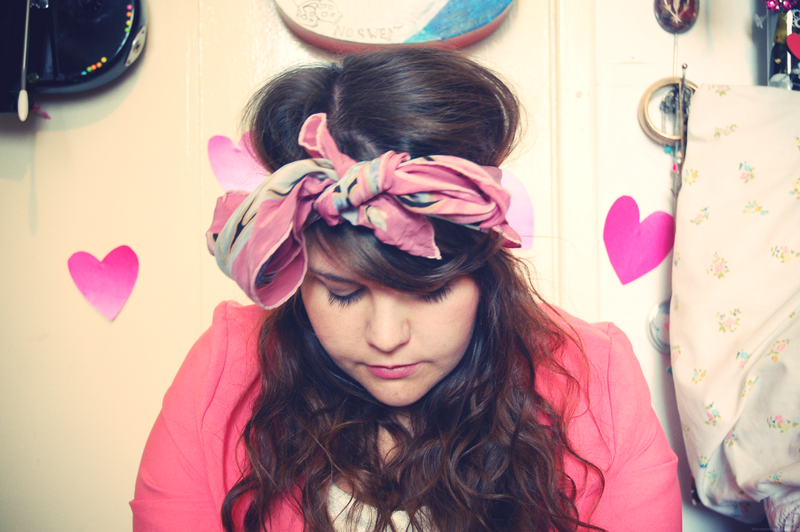 Ace scarfs… If I see a pretty vintage scarf I just cannot leave without it! I wish my hair was long enough to do this with! Mines too short i just end up looking silly! You're silly and I like it. I love vintage scarves too, though I always forget to actually wear them! You have a cute blog. Love it! Wearing a scarf today inspired by you! And inspired by covering the grease in my hair.